» Filed Under: Beautiful Charts,Project Progress,User Manual. This is a chart of the Euro-USD exchange rate, produced by the software, analysing data up to Friday 30th May 2008. The thick BLUE line is the “price” line – the exchange rate between the two currencies. To the right you will see the price scale, with the closing price of Friday 30th May highlighted in a red box – it is red because the price has FALLEN (is lower) from the previous day’s closing price. The thin multi-coloured lines are the lines Hurst calls FLD’s – Future Lines of Demarcation. Price is surrounded by a “dominant channel” the purple dotted lines that form an envelope around the price movement. Along the bottom of the chart is the last part of the phasing analysis for this chart. To the right you will see the cluster of small circles within lines, with a grey shaded background. This indicates that we expect a nest-of-lows within the next 7-10 days, with a strength of about 20 weeks. You will also see some VTL’s – Valid Trend Lines, as defined by Hurst. These are the straight dotted lines, with small boxed labels giving the wave period of the VTL. Notice also the TRIO of moving averages, moving around the price line. One is dark red, one blue and one green. These lines are not Hurst-inspired, but are a personal refinement by which I calculate refined FLD projections. Updated Phasing Analysis reveals that the dominant cycle has a wavelength of 16.9w, or 118 days. This is assumed to be the 20w nominal wave, which implies that all waves will be (-14%) shorter than nominal. This cycle is approaching a TROUGH (and a medium degree nest-of-lows). The underlying trend to this cycle is currently FLAT, likely turning DOWN. 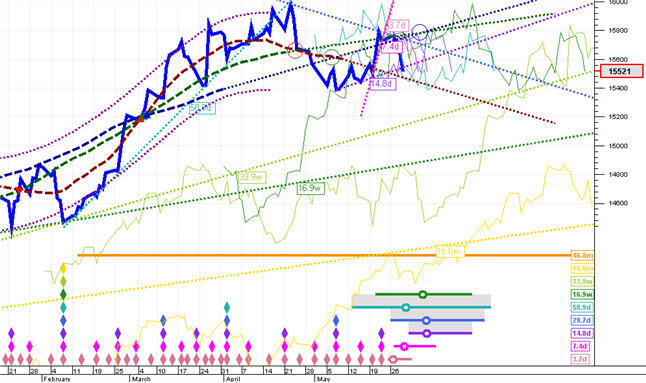 The future FLD indicates that this cycle will influence prices to peak in a short while, and then to fall. The sub-dominant cycle (next wave down from the dominant cycle) has a wavelength of 58.9d, or 59 days. This is assumed to be the 80d nominal wave. This cycle is overdue for a PEAK. This is probably the second of 2 sub-waves. The underlying trend to this cycle is currently FLAT, likely turning UP. The future FLD indicates that this cycle will influence prices to peak soon, and then fall. The pre-dominant cycle (next wave up from the dominant cycle) has a wavelength of 33.9w, or 237 days. This is assumed to be the 40w nominal wave. This cycle is approaching a PEAK. The underlying trend to this cycle is currently strongly UP. The future FLD indicates that this cycle will influence prices very little because despite near-term volatility the FLD becomes range-bound. The last phasing analysis was 4 days ago. In that time price has FALLEN by 244 to 15521. Sequence #1 of the previous pattern: Price did move DOWN (for 3 days) as expected and has moved towards the target of 14954. The closest price has gotten to this target so far is 15394 (2.9% short) 1 day ago. This target is now 38 days away. Sequence #1 is expected to reach a LOWER target of 14808(-146 diff) 4 days EARLIER, on 2008/06/12 Recent price action has generated a new sequence (# 1). The target of this projection is 13624, expected by 2008/10/06. There is no cycle which provides an average potential of at least 20% per half-cycle, and so it is not recommended that you trade this stock unless you are trading on a leveraged basis, in which case you should change the Trading Settings by using the Tools|Trade Settings|Edit menu. Having reviewed the entire projection sequence I am unable to find a move suitable for trading, and so no trades have been set up. Well – that’s what the software is “thinking” about the Euro-USD as of the 30th May. It seems pretty likely that things are going down, and that the upcoming nest-of-lows will generate little more than a temporary upward correction to the downward move. However it is early days for the software, and so I am by no means making any kind of call on this, I merely put it up here to show what the software’s doing at the moment. Interesting article. I’ve just begun using the Hurst methods and will be grateful if you could answer the following question for me – where is the best place to draw FLDs from – from price lows associated with wave low or price highs associated with wave high. The “best” place depends on what you are doing. Generally you should use the median price, which is halfway between the High and the Low price (formula: [H+L]/2). This is the correct FLD to use for calculating projections based on where price crosses the FLD, but if you want to use the FLD as an “action signal” to buy or sell then you should use the following: as a buy signal use the FLD based on the High price, and as a sell signal use the FLD based on the Low price. Or alternatively download The Hurst Trader, which does all that automatically!